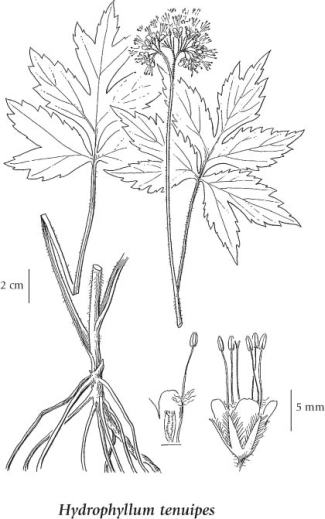 Pacific Waterleaf is a red-listed species in British Columbia that is found in North America from southern British Columbia south to northern California (Douglas et al. 1999). It reaches its northern limits of distribution in British Columbia. In BC, it is restricted in occurrence to the Fraser Valley (in the Abbotsford area and Chilliwack areas) and southern Vancouver Island, where t occurs in clonal patches in rich moist soils in woods and along streams (Douglas et al. 1999). Populations in the Fraser Valley are significantly threatened by expanding urban development, directly through site loss and indirectly through habitat decline. Pacific Waterleaf has not been assessed by COSEWIC. Read more about this species in BC. Perennial herb from a short or elongate rhizome; stems spreading to ascending, solitary, usually reflexed-hairy, 20-80 cm tall. Mostly basal, 10-25 cm long, 6-15 cm wide, long-stalked, somewhat palmately divided into 5-7, hairy, toothed, pointed leaflets. Inflorescence of moderately compact, long-stalked clusters of funnel-shaped flowers; flower stalks 5-12 mm long; corollas green to greenish-white to blue or purple, 5-7 mm long, stalked, 5-lobed, the lobes 3-4 mm long; styles and stamens protruding beyond the corolla; calyces long-hairy on the margins, the lobes lanceolate. 1. Leaflets coarsely toothed along the margins; rhizomes usually conspicuous. Moist woodlands and streambanks in the lowland zone; rare on S Vancouver Island and the lower Fraser Valley; S to N CA.